Happy Memorial Day all! What better way to start the day than some delicious homemade donuts? I’m highly addicted to sweets and anytime I can have sugar for breakfast then I’m sold. I do have to admit though, I’m not entirely a breakfast person. Yes I know they say that breakfast is the most important meal of the day, but I’m sorry I’m just not a breakfast person! Have you ever been to one of those bakeries that sell all these off the wall donuts? I haven’t. We really don’t have a larger bakery with those options around me. The closest one is about 45 miles away and boy I have to admit, I’m in love. Usually they don’t have donut versions of their amazing flavors but they do have some awesome cupcake flavors. Alas, I am here to fill the void of what I so lovingly seek. These donuts are seriously super simple to make. If you do not have a donut pan you can take a muffin tin and roll up some tin foil and place them in there as well. Now the donuts will be smaller but it will still work, just means the more there is for you to enjoy! This recipe makes about 6 donuts depending on how much you fill each well. Pre-heat oven to 400. In bowl, add all dry ingredients and stir to combine. Add egg, sour cream, milk, vanilla, butter and crushed butterfingers. Stir everything until just combined. Spray your donut pan with non-stick cooking spray. In a plastic bag or piping bag add your dough. Push out any air and seal. Cut a hole in tip and start piping into wells. Bake for 8-10 minutes, when done remove to cooling rack. Meanwhile to make your glaze, add all glaze ingredients in bowl and stir to combine, you may add extra water to adjust for desired consistency. In a separate bowl place your extra 6 crushed butterfingers. 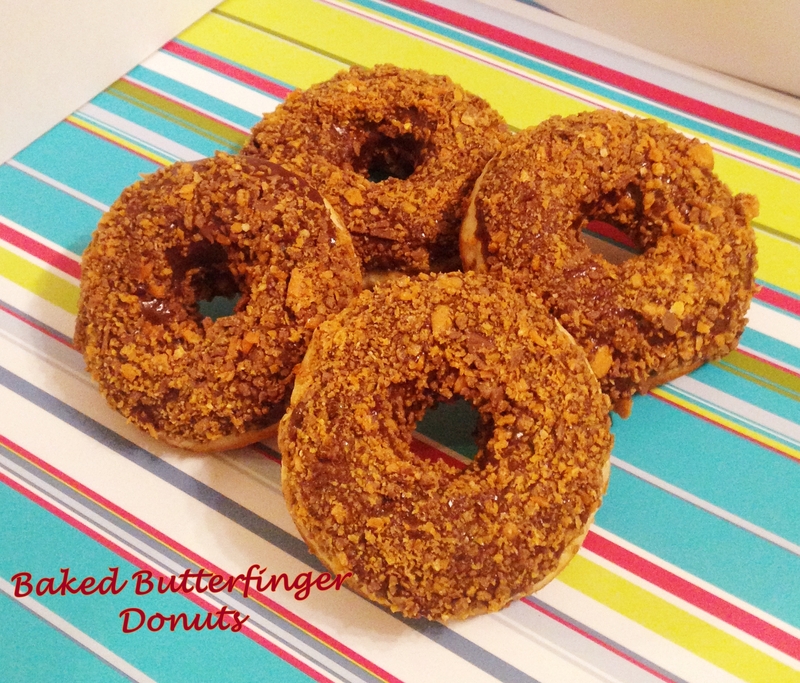 When donuts are cooled, dip the tops of each donut in the glaze then immediately into the crushed butterfingers. Place back onto cooling rack to set. Serve and enjoy!